On the evening of June 15, in Naha a patrol team dispatched by the MOD leaves to do its rounds on Okinawa Island. On July 26, news covered that the Ministry of Defense (MOD) dispatched 60 officers to Okinawa to help as crime prevention patrols in response to the incident of a woman assaulted and killed by a U.S. base employee, but that the officers are instead on-duty as guards to the helipad construction site in Higashi Village, Takae. 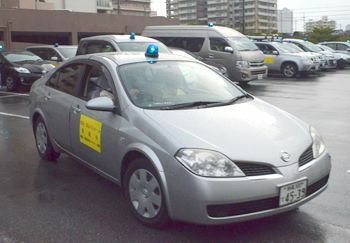 These patrol officers, extolled as an incident prevention policy, are actually engaging in work to suppress Okinawan citizens’ protest activities. This calls the lawfulness of dispatching these personnel into question. A contact person at the MOD said that the personnel were intended to both patrol and guard against protest activity, explaining that it is better for patrolling officers to be familiar with local geography. The contact person asserted that it is also essential that the personnel deal with helipad construction. The MOD and government started crime-prevention patrols in June within Okinawa in response to the U.S. base employee incident, and anticipated the shortage of Okinawa Defense Bureau (ODB) personnel to assist with helipad construction planned for resumption in July. As such, the central MOD and the local ODB dispatched approximately 60 personnel within Okinawa on and after July 13.